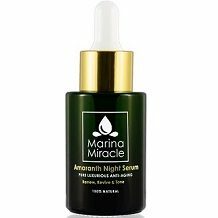 The following review is for a product from Marina Miracle called Amaranth Night Serum. According to the manufacturer, this product is a good option for individuals who are looking for a nourishing night serum. This product contains a variety of ingredients that specifically penetrate the skin to protect and replenish the epidermal layer in the skin. According to the manufacturer, continued use of this product will help to reduce the appearance of fine lines and wrinkles. Additionally, this product could even boost the production of collagen in the skin, which will keep your skin healthier and smoother. The manufacturers of this product recommend that you apply this serum to your face at night before applying your night cream. You can also use this product in the mornings. They recommend that you apply it in a circular motion. Unfortunately, this product is not available in an airtight pump bottle. This product is available directly from the manufacturer on their online store. One bottle of this serum is available for the retail price of $110.00. Unfortunately, we were not able to find any information regarding discounts or special offers that are available for this product. We were also unable to find any information regarding shipping fees for this product. Once we completed our review of this product, we found that this might be a good option for individuals who want to maintain younger looking skin. This product contains Hyaluronic acid, which is excellent for the maintenance of your skin. Additionally, the manufacturer of this product provides excellent instructions that are simple and easy to understand. However, we are not sure if this is the best product available. The manufacturer of this product included an excessive amount of additional ingredients in this formula, the majority of which are artificial. Additionally, we found that this product was rather expensive when compared to other similar product. Finally, we were concerned that the manufacturer does not disclose what the active ingredients are in this formula.